Anywho, yesterday I found this blog that gives awesome instructions and tips for floral arrangements. If we weren't going out of town this weekend, I would have already tried some of these but I'll have to wait until next week so I can fully enjoy the fruits of my [floral] labor. Reading the blog posts yesterday ignited my love for flowers and floral arrangements again and even gave me an ambitious sense of excitement...if that makes any sense. But I also am a bit of a cheapskate when it comes to flowers. I only buy them from the supermarket/grocery store or farmer's market. Often their selection is just as beautiful to me and it's much easier on the old wallet, you know? And since flowers usually only last a week or so, I just can't afford to drop $50 on something that dies in 6 days. So, armed with my new floral arrangement knowledge, I'm sharing with you 5 of my favorite supermarket/grocery store flowers to use in home floral arrangements. 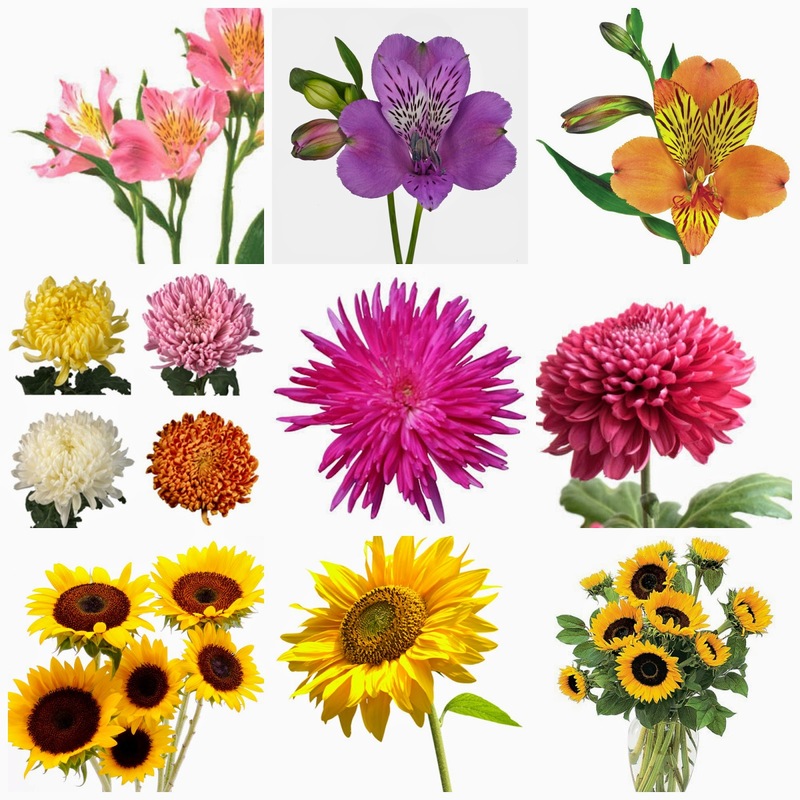 These are flowers that are hardy and look great in arrangements. I'm a big fan of using any of these and my budget is too! Row 2: Chrysanthemums - Mums are beautiful standalone flowers. Spider mums look awesome in arrangements since they tend to stick out! Row 3: Sunflowers - One of my all-time favorites. 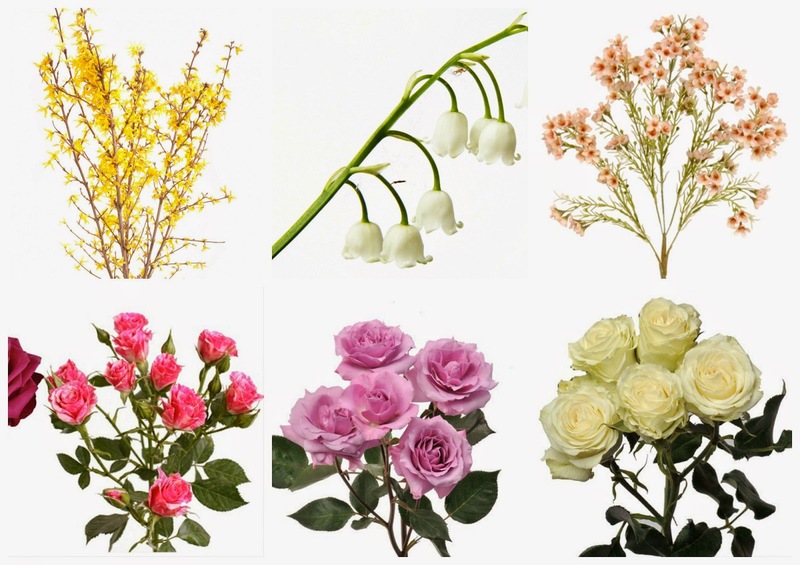 Row 1: Flowering branches - Forsythia (left), Lily of the Valley (center) and Waxflower (right). These are great to add height and interest to arrangements. Row 2: Spray roses - Though I'm not a huge fan of roses, I like that the spray roses are already bunched so they are great as filler flowers. Lilies- they are beautiful but I'm highly allergic to them. I cannot use these in my home. It should be noted that some of my absolute favorite flowers are usually not found at supermarkets but at flower shops and florists. They are just a bit too unusual for the average grocery store to carry. However, if you find any grocery stores that carry poppies or ranunculus, let me know! There are lots of great flower options at your local supermarket. If you are blessed to live near a Publix, they have some of the best flowers (and prices) I've seen grocery stores. Now, take your new floral arrangement tips and get to the store! I love chrysanthemums! I buy from Produce Junction and make it a game - what can I get for $3 or $4 that week? Awesome flowers and I simply love chrysanthemums. Even when I book any bouquet order from online Same Day Flower Delivery NYC for my loved ones, I make sure to include carnations in them as they give all-together a different look to your bloom.